Willows, Calif. (16 April 2017) – Race 2 of the 2017 Pirelli GT3 Cup Trophy USA saw a familiar name return to the top of the leaderboard, as two-time series champion Loren Beggs weathered rain and race-long pressure from Jesse Menczer to take the overall victory in a caution-free 12-lap battle at Thunderhill Raceway. Proof that the California drought might truly be over greeted the field early in the afternoon, as threatening skies gave way to rain and slick conditions as the cars came down to the green flag shortly after 1:00 p.m. local time. Beggs, who had put his No. 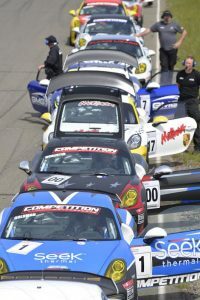 08 911 Design Porsche GT3 Cup car on the pole position in dry qualifying earlier in the day, led Menczer across the line as the pair immediately began to separate from the rest of the field. Menczer, behind the wheel of the No. 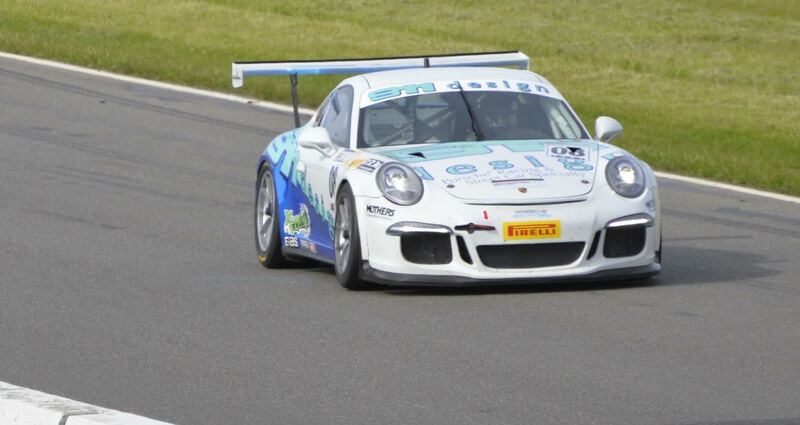 84 BR Racing Disktech Porsche GT3 Cup car, refused to let Beggs get away, challenging him throughout the first lap until he made a pass stick on lap two. The pair continued to battle nose-to-tail until Beggs was able to use traffic on lap five to return to the lead for good, though Menczer stayed in his mirrors all the way to the checkered flag. Meanwhile, Russell Ward and Alex Kirby swapped positions on lap seven, with Kirby taking the final podium position while Round 1 winner Max Root came home fifth in the Diamond Class. This season sees a Masters division join the Diamond Class, with South African Bryce Ward taking his first series victory over 2016 Platinum Cup champion Tom Haacker. Ward, driving the No. 57 Winward Racing entry, started on pole and was able to keep cars between he, Haacker, and Mike McAlister in third, focusing his attention on managing traffic and the difficult conditions. The Platinum class (for the Porsche 911 997.2 version) was its usual spirited affair, with Ray Shahi taking victory number two of the season for his TruSpeed Autosport team. Shahi finished second to teammate Larry Schnur in last year’s class championship and the battle between the pair was rejoined this weekend, with Shahi starting on the class pole in Race 2 only to tangle with traffic mid race, allowing Schnur the chance to get by. The pair raced in close proximity for several laps as Shahi fought back, getting around Schnur for the lead on lap seven, with David Lockwood (who came back from his own lap one contact) finishing third. The Silver class for Porsche Cayman GT4 Cup cars once again showed its competitive nature, with pole sitter Jeff Kearl, driving the No. 26 Rearden Motorsport Company entry, and 2016 champion Sean McAlister racing hard and close throughout the race. McAlister took the lead on lap one, only to see Kearl return the favor on the white flag lap. Kearl finished with McAlister right on his rear wing, with Hutton McKenna coming home in third. In the Silver Masters class, Martin Brauns, driving the No. 59 Porsche Cayman for Flying Lizard Motorsports, took the wire-to-wire victory over Carl Tofflemire and his Flying Lizard teammate Thomas Mayerhoffer. Competent Motorsport President Greg Franz was pleased with the Easter weekend racing, especially given Sunday’s difficult conditions. 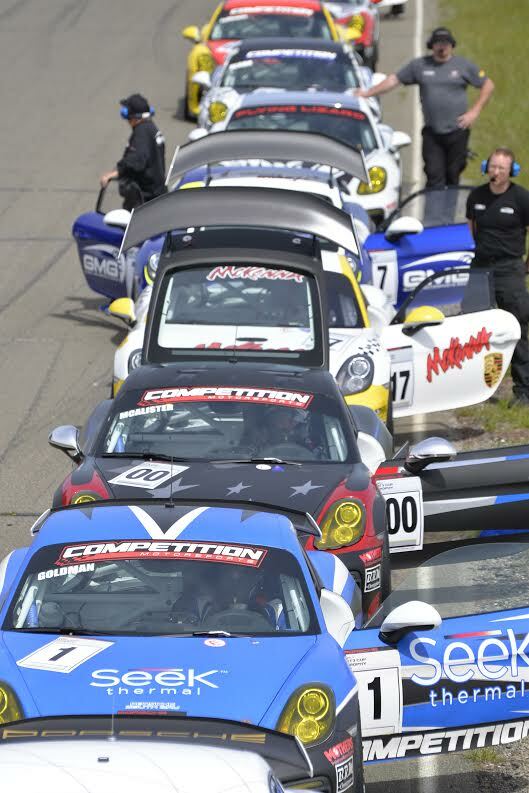 The Pirelli GT3 Cup Trophy USA returns to Sonoma Raceway in May, hosting Rounds 3 & 4, May 19 – 21. This entry was posted in News on April 16, 2017 by admin.